Please join us on the First Friday of December for Tea Thyme's Annual Holiday Tea Party with an evening of celebration and gift shopping. 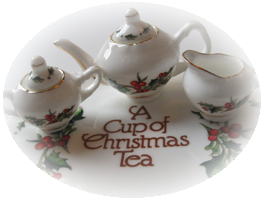 Enjoy festive teas, delightful wines, decadent treats and an enjoyable evening during the party. Choose from a lovely assortment of absolutely beautiful gifts for everyone on your holiday list. 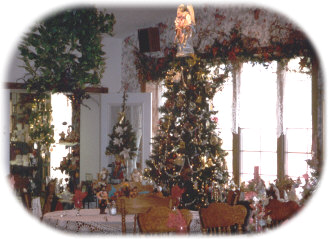 Nowhere will your holiday celebration be more special than at Tea Thyme. From our sumptuous Easter and Mother's Day brunches to romantic Valentine's Day dinners and our most popular private Christmas parties, your holiday entertaining will be carefree at Tea Thyme. Reserve early to ensure your choice of dates is available. Contact Deb or Missy at 515-576-2202.
to delectable sandwiches, petits fours, and glazed scones, the party will be memorable. The Tea Party Makes a Comeback! It's Tea Time - How about a Spring Tea or a Summer Tea? Today ladies of all ages, across the country and world, are enjoying the tradition of Tea Time. It's not a trend, but a revival of a tradition that has been observed for a long time in history. Private parties for special brunches, showers, birthdays, anniversaries, graduations and holidays are always done with flair at Tea Thyme. Private functions are currently available for brunches, afternoon desserts, and evening dinners or hors d'ouvres. A minimum number of 25 guests is required for evening events.